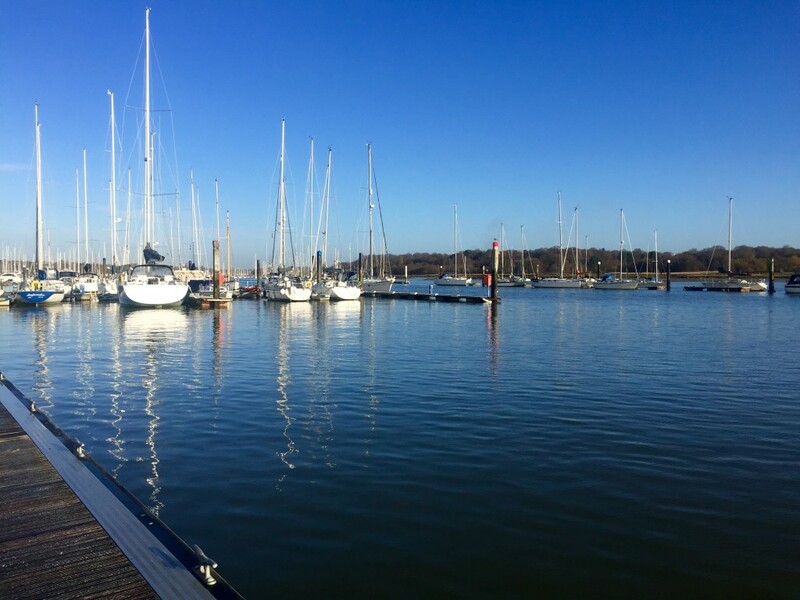 There are two ways to observe the yachting community on the River Hamble: go there, or watch the 1980s series “Howards’ Way”. Having watched a few minutes of the latter on YouTube recently, I can safely say that visiting in person is the best option. However, if you’re one of the 14 million people who tuned into the show every week, you might enjoy both. 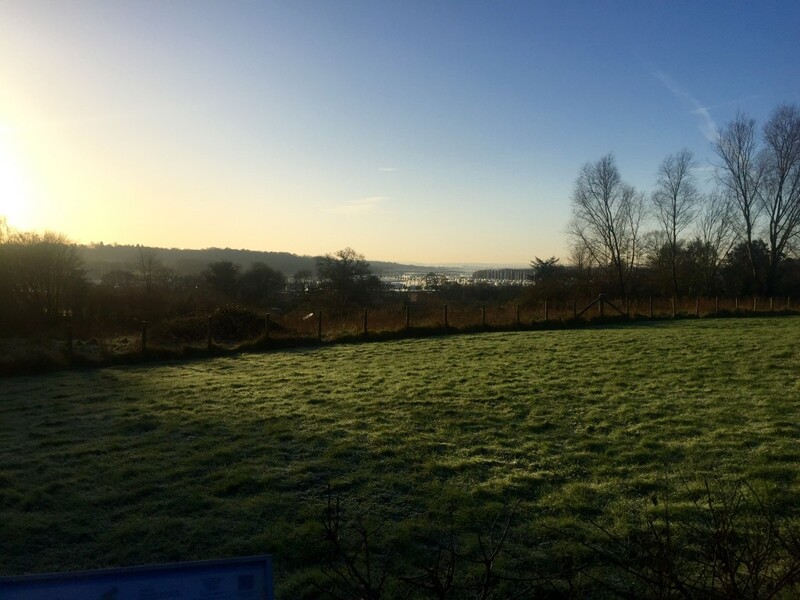 We’re lucky in that we can walk down to the river from our house through Manor Farm Country Park. 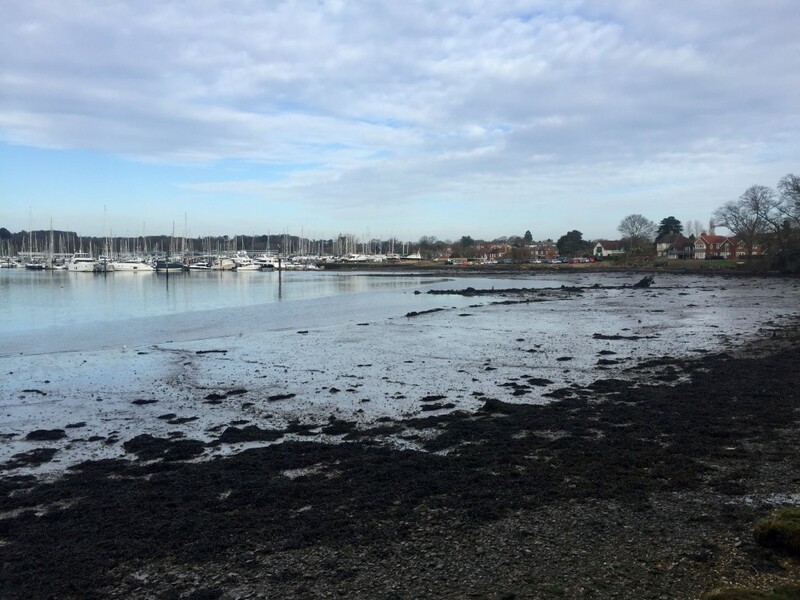 There’s then a circular walk you can pick up at Bursledon via Hamble, the Hamble-Warsash ferry and the riverside path from Warsash to Lower Swanwick. 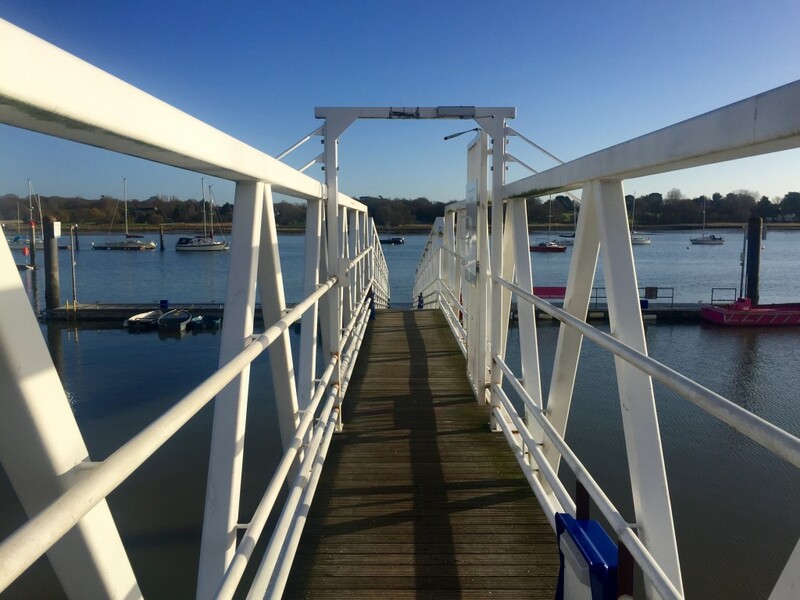 It’s a fair yomp – about 9 miles – but you can shave off a couple of miles if you park at one of the free car parks at Bursledon train station or the public slipway at Lower Swanwick. If you want to do the walk from Hedge End you can park at the Norman Rodaway playing fields (off Heath House Lane). We walked the route on Saturday morning as a replacement for my long weekend run, which I didn’t fancy because of the ice that had appeared overnight. When we left just after 8am, the sun had only just come up. We headed down through woods into the country park and crossed the wooden bridge over the creek towards Bursledon. 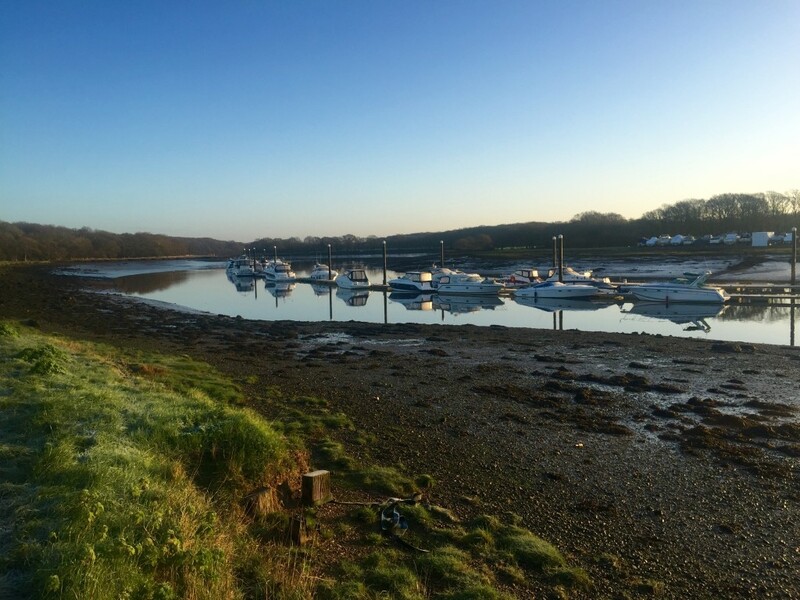 After we walked through a frosty field and ducked under the motorway we passed through one of the many boat yards that line the Hamble’s lower reaches. We then crossed the A27 and went up the steep footpath by Bursledon train station. Howards’ Way fans should note that the show’s pub, The Jolly Sailor, is a couple of minutes’ walk from here. 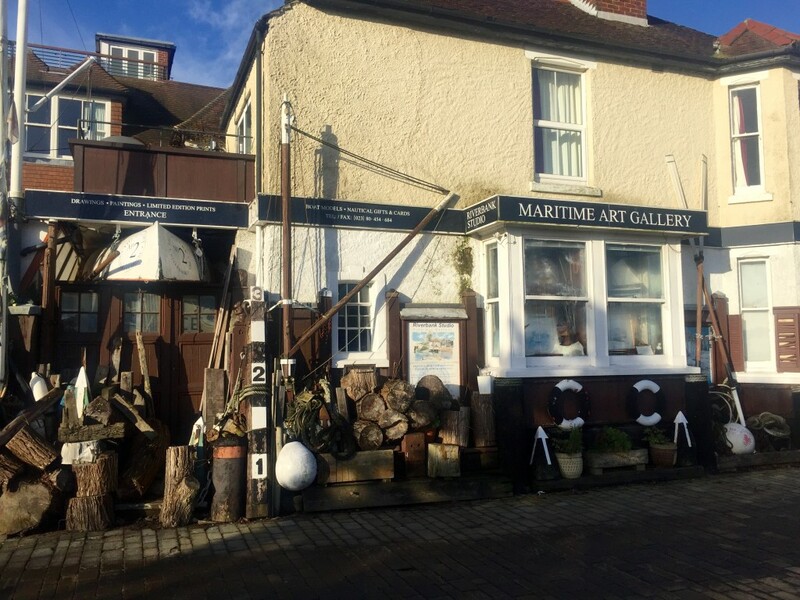 The route then moves away from the edge of the river and goes through the quaint streets of Old Bursledon past the Old Vine Inn pub and the village’s former post office. At the summit of the hill, there’s a great view down the river to Southampton Water, the Solent and Isle of Wight beyond. 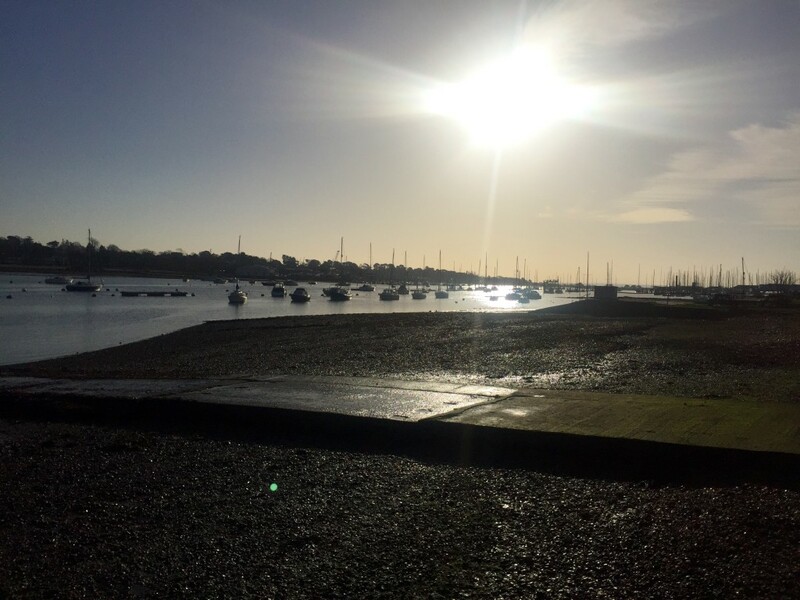 After Burseldon, the walk isn’t that exciting until you reach the boating mecca of Hamble, with its quaint, cobbled street leading down to the water’s edge. 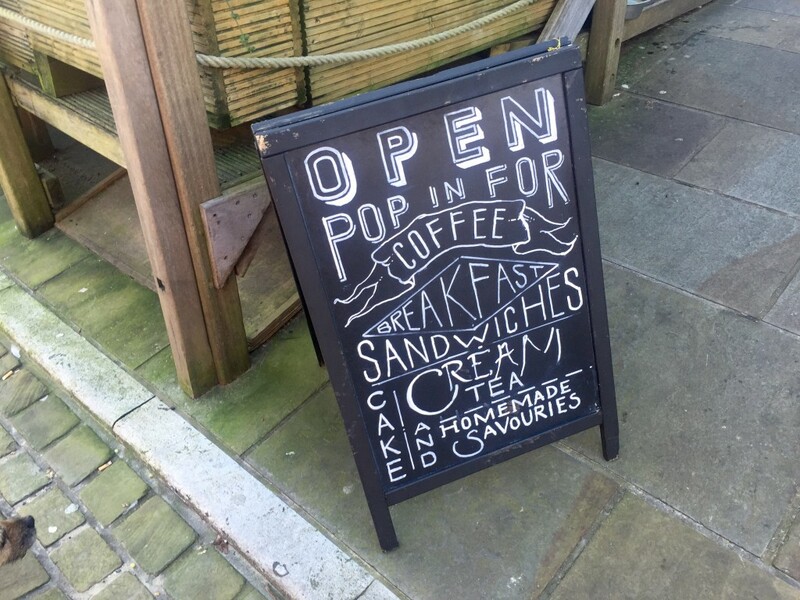 Here we refueled with a couple of takeaway coffees and a breakfast bap for Tiff at Bonne Bouche – a deli and cafe that’s situated half way down the cobbles. Dogs aren’t allowed inside. However, they’re well looked after with doggie treats and a water bowl available. 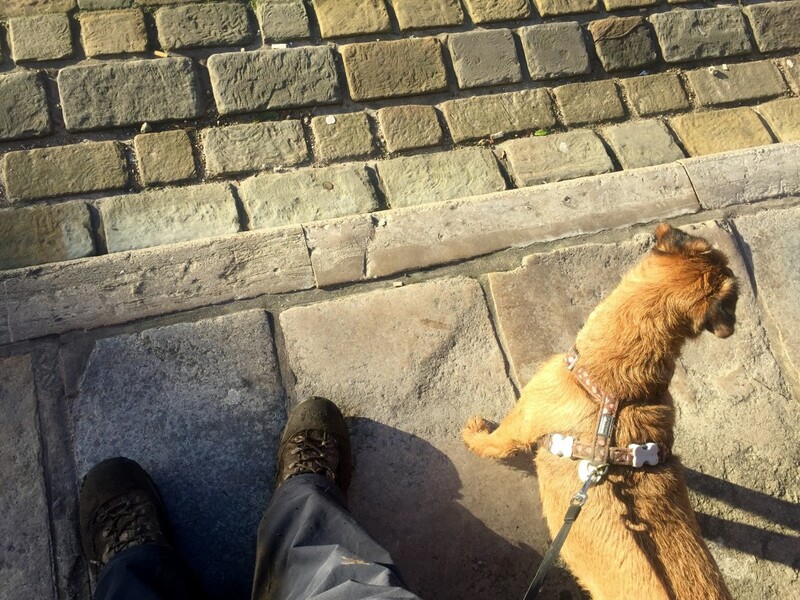 It looked like it was popular with humans too, with lots of comings and goings as I waited outside with Tilly. 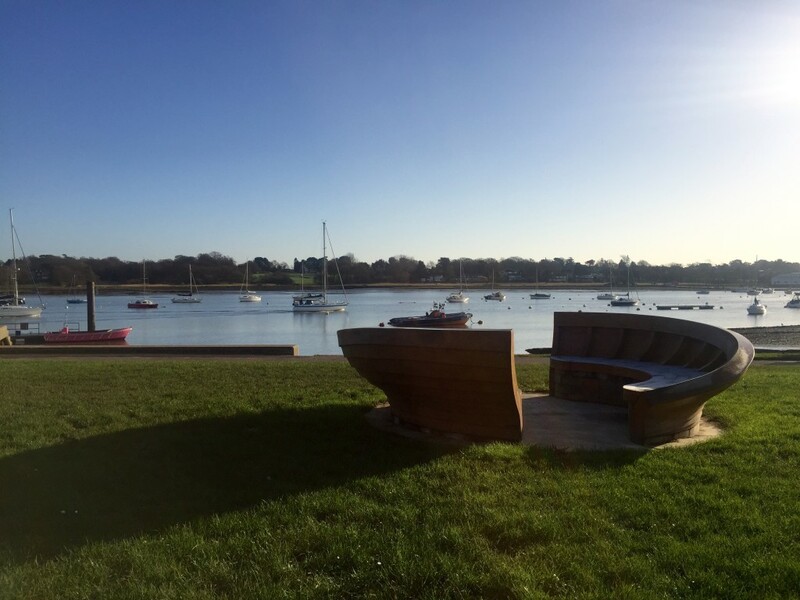 As the sun was shining and we were well-wrapped up we took a seat on a waterfront bench to drink our coffees. The water on the river was completely still, bar a few gentle waves making their way to shore from the occasional dingy or yacht out for a Saturday morning sail. 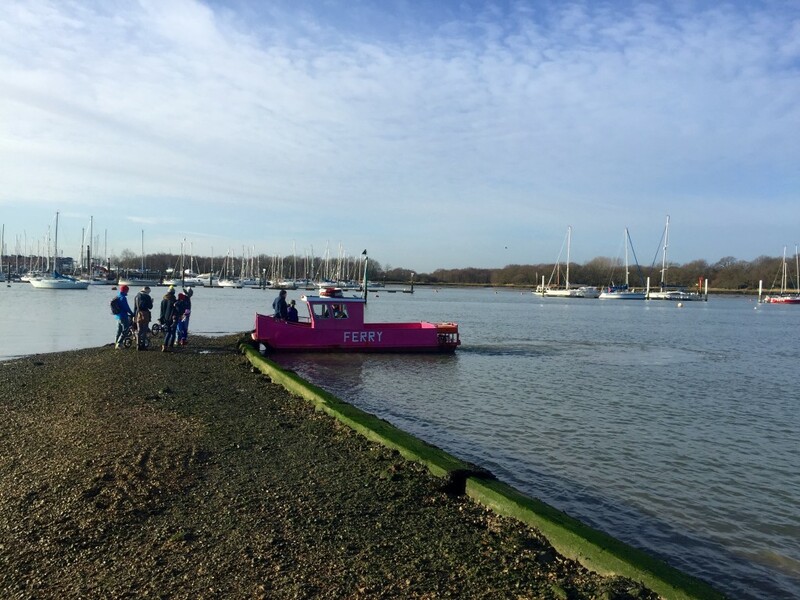 Rested, we then made our way down the pontoon to catch the famous pink ferry over to the Warsash side of the river. There’s been a ferry here since at least 1493. 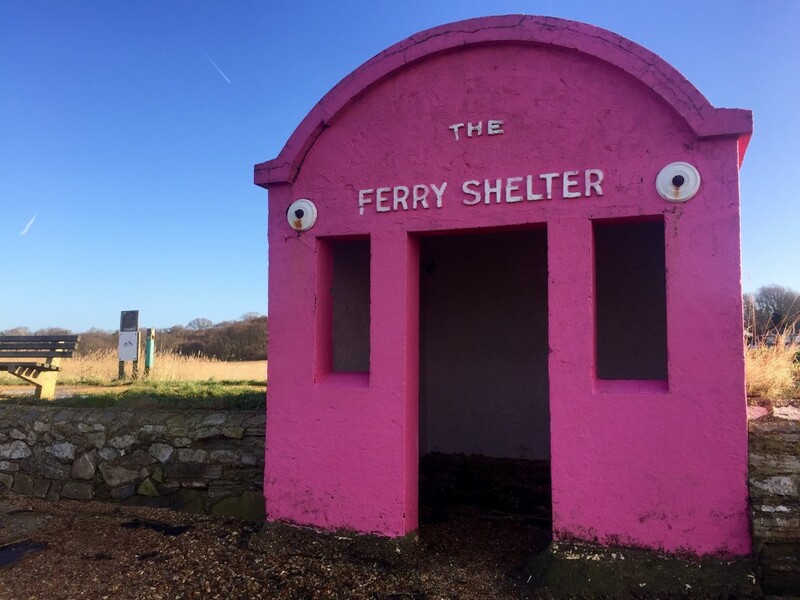 It used to be plain white – owner Mike Lindsell decided to paint them pink after he bought the business in 2002. After a short wait for “Claire” to complete her trip from the other side, we boarded and paid Ray the veteran ferryman our £3. Tilly needed some encouragement to get on board – she’s not keen on travel unless its under her own steam. 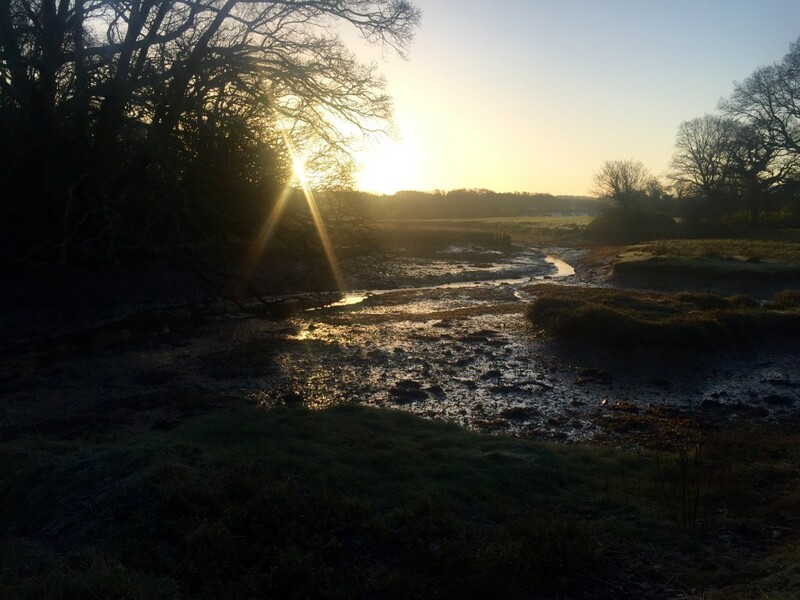 Once we disembarked on the Warsash side, we headed back upstream along the path that dissects the river and the “Bunny Meadows” mudflats. It was much colder on this side of the river and I was soon dressed up like Sir Edmund Hillary again. After the Bunny Meadows, we passed a field teeming with the donkeys from the local sanctuary and passed through another boatyard. The path then comes out at the public slipway car park in Lower Swanwick where you need to walk a short while along the relatively unattractive A27. It’s not all bad though, as you can make a beeline here for more refreshments at either the Boat House Cafe or the Navigator pub. Unfortunately, we were pushed for time today. So we made do with a gulp of water as we picked up the reverse of our earlier route back under the M27 to Manor Farm Country Park. 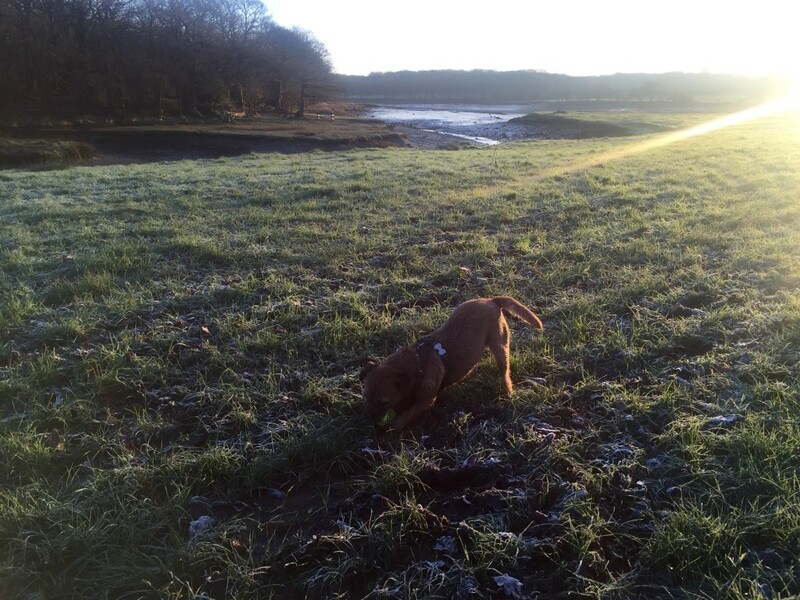 By now, the frost in the fields had melted, replaced by a squelching mess underfoot. Naturally, Tilly managed to get most of it on her undercarriage – she was due a bath anyway. Info: Bonne Bouche is open Monday-Friday 8am-4pm and Saturday and Sunday 9am-5pm. 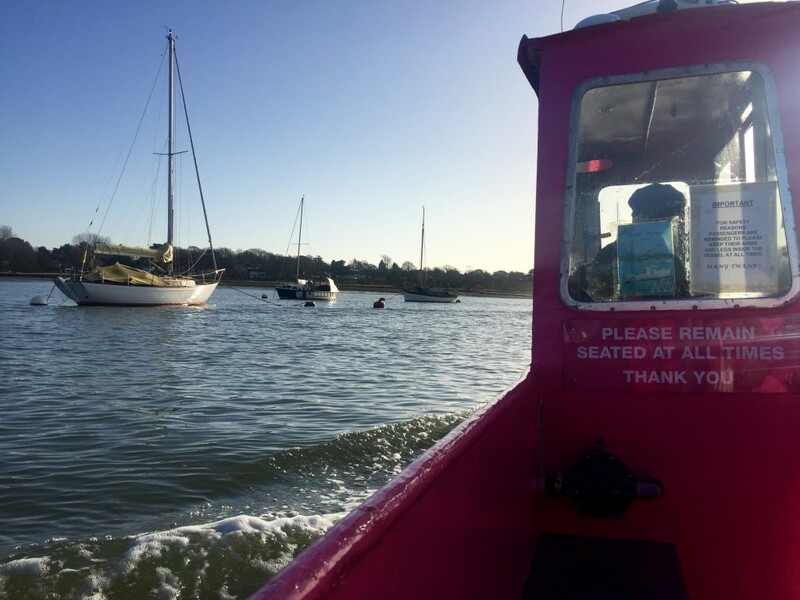 In winter, the Hamble to Warsash Ferry runs from 9am-5pm. From the station car park, head up station hill or go up the steps at the far end of the car park. At the junction at the top of the hill, head right along “High Street” into Bursledon village. Follow the road for around 1/3 of a mile past the red phone box turning on your right and Salterns Lane on your left. After Salterns Lane, take the footpath to the left near where the road bends to the right. You’ll soon reach the end of a road. Continue straight along the next path and over the stream. At the top of the hill, the path turns left and then right when you come out of the trees. Cross the track and continue straight. Follow the path around the edge of the field. Ignore the path on the right and continue across the railway bridge. When you get to the road, cross it and then head left along the edge of the field. When the hedge on the left follows the road, continue straight on across the field. Alternatively, follow the hedge and head to the footpath on the edge of the field. Then follow it right along the field’s edge. Walk past the cricket pitch on your right and then take the first path concreted path left. At the road, head right until you get to Hamble Square. Then head down the “The Quay” to the water. Take the ferry (£1.50 adults, £1 kids) across to the other side of the river. At the road, follow it left and then at the main road go left. Bursledon station is left straight after you pass under the railway bridge.